The 88.4 meter blade has been developed and built by LM Wind Power specifically for Adwen's AD 8-180 wind turbine model. 21st June, 2016 - Adwen and LM Wind Power have partnered to take a large step forward towards lowering the cost of energy in offshore, putting their respective technology expertise together to present the longest blade in the world. The huge component of 88.4 meters has been specifically designed for Adwen's AD 8-180 wind turbine model, with 8MW nominal capacity and 180 meter rotor diameter. The first of these huge blades has just been manufactured at LM Wind Power's factory in Lunderskov (Denmark) and will be transported to a facility in Aalborg in the following days, where it will commence rigorous testing in the framework of Adwen's extensive product validation plan. The engineering teams of both companies have been working together for months to design and integrate a blade that represents an important step forward in the race to lower the Levelized Cost of Energy (LCoE). With the largest rotor in the industry (180 meters), the AD 8-180 has the highest annual energy production (AEP) of all wind turbines. The LM 88.4 P blade has been designed with manufacturability and reliability in mind, benefiting from the unique know-how of LM Wind Power, developing large blades for offshore application for the past 25 years and resulting in a 925 MW installed base. LM Wind Power's track record combined with Adwen's powerful turbine, technology and unique experience from operating 630 MW offshore wind farms has resulted in a state of the art rotor integration with innovative features, building on proven technologies. The 88.4 meters length of the blades is the best compromise between swept area, energy production, and the weight as well as the loads transferred to the wind turbine. This combination provides the optimum balance of plant costs and contributes to one of the most competitive LCoE in the industry. In addition, the blade design has been conceived with scalability in mind to enable the further development of Adwen's 8 MW platform. "When you are building the largest wind turbine in the world, almost everything you do is an unprecedented challenge. We are going where no one else has ever gone before, pushing all the known frontiers in the industry. Having developed and integrated together with LM Wind Power the first unit of the longest blade ever and being able to start testing is a key step forward in the development of our AD 8-180 and proves that Adwen is at the forefront of the industry", says Luis Álvarez, Adwen General Manager. LM Wind Power's CEO, Marc de Jong adds: "The LM 88.4 P blade is an extraordinary example of industrialized innovation at record breaking scale. It is based on innovation building blocks, rooted in 35 years of real life experience, in the design, technology and manufacturing of ultra-long, reliable blades. This blade is a strong proof point of the shared ambition of Adwen and LM Wind Power to bring forward best in class and proven rotor solutions for offshore application, increasing Annual Energy output through efficient and reliable technology." The AD 8-180 is based on Adwen's proven 5 MW platform of which the company has installed more than 120 wind turbines at sea. The first onshore prototype of the 8 MW will be installed by the end of the year in Bremerhaven (Germany), with type certificate expected for 2017 and serial production for the year thereafter. Adwen is a 50-50 joint-venture of AREVA and Gamesa dedicated to offshore wind. Adwen is responsible for the design, manufacturing, installation, commissioning and services of offshore wind turbines. Combining both AREVA and Gamesa wind expertise and extensive track-record, Adwen is ideally positioned to become a leading player in the offshore wind segment with the objective of garnering a market share of close to 20% in Europe by 2020. Adwen has corporate offices in France, Spain, the UK and Germany. LM Wind Power is the world's largest independent supplier of rotor blades for wind turbines, with a global manufacturing footprint that includes blade factories in Brazil, Canada, China, Denmark, India, Poland, Spain, and the United States. 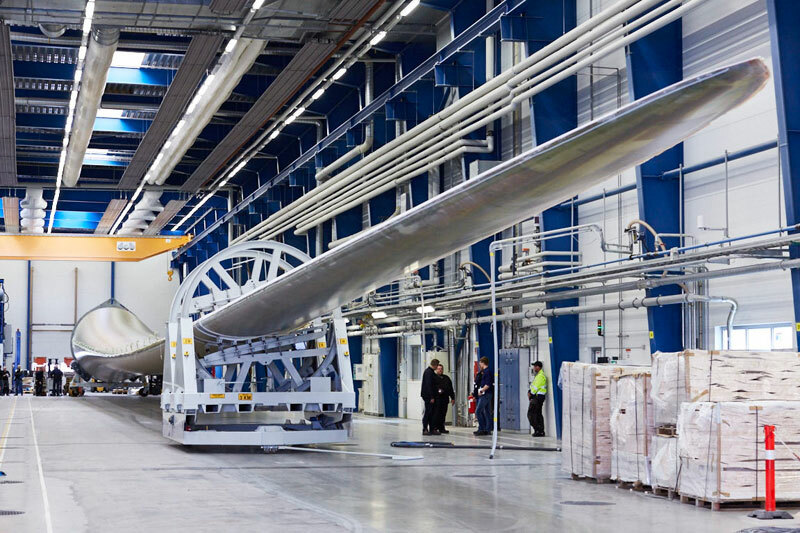 The company was founded in Denmark in 1940 where it also has a global R&D and Technology Center for the design, development, manufacture and testing of state of the art wind turbine blades. Approximately one in five wind turbines installed worldwide has LM Wind Power blades.